The Library Services Department has embarked on the creation of a Cultural Heritage Database with the launch of the Digitisation Project during Library Week 2014. In a ceremony held yesterday, April 24 at the Road Town Branch of the Library Services, Mr. Larry Lyerly, Branch President of the Tortola Branch of the Church of Jesus Christ of Latter Day Saints presented the system to the Library Services Department which falls under the umbrella of the Ministry of Education and Culture. Acting Deputy Secretary Mrs. Prudence Mathavious accepted the gift on behalf of Minister for Education and Culture Honourable Myron V. Walwyn. Mrs. Mathavious spoke to the importance of the system and how it will aid in the creation of a cultural heritage database for the Virgin Islands. She stated that the main objective of the project will be to digitise all the cultural and historical documents in the Caribbean Studies’ Unit. Mr. Lyerly spoke to the delicate condition of older documents and how this restricts access to such documents. He said these documents are often difficult to find, are in a very delicate condition and have to be handled in a particular way. He revealed that the funds for this project were donated anonymously and were allocated for use in the Virgin Islands. Chief Librarian Mrs. Suzanne Greenaway stated that as part of the agreement with the Church, the information gathered from the digitisation project would be accessible to the public free of cost. She noted that a similar project started before on a small scale which was accessible at only one computer but this system documents can be accessible throughout the library system. The digitisation project started in 2012 in collaboration with Acting Chief Records Management Officer, Mr. Christopher Varlack and Elder Kip Hansen and Sister Arden Hansen of the Church of Jesus Christ of Latter Day Saints. 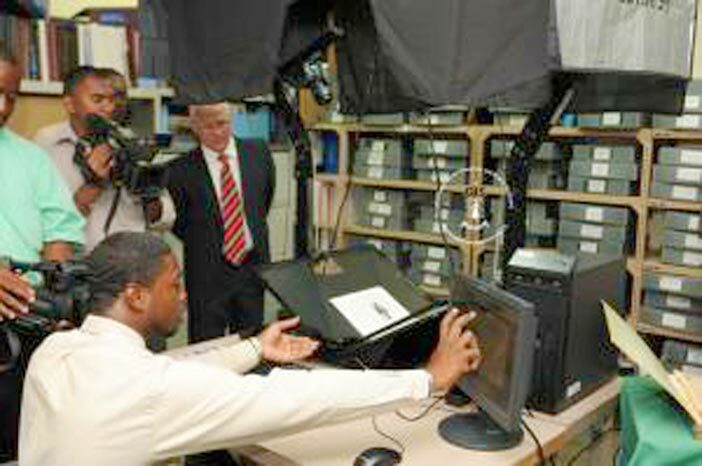 The launch of this digitisation system will improve access to the Library’s documents as they conserve and preserve the cultural heritage of the Virgin Islands. Library Week 2014 is being celebrated from April 20 to 26 under the theme “Public Libraries: Continuing to Build an Intellectual Virgin Islands in the 21st Century.